The Associated Students University Council convenes for its bi-weekly meeting Sept. 27. 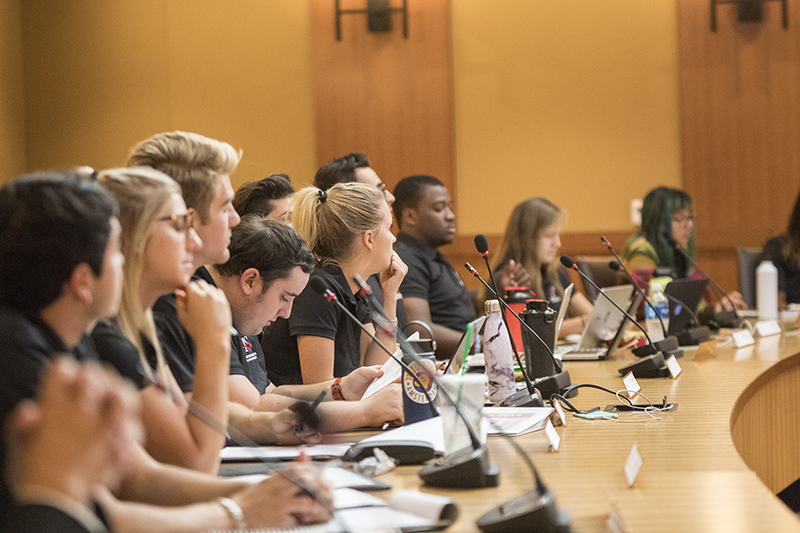 The Associated Students University Council met for its bi-weekly council meeting on Sept. 27 to discuss emergency funding for DACA recipients, the upcoming Aztecs Rock Hunger Campaign, Aztec Recreation accomplishments and more campus updates. The A.S. University Council announced the Economic Crisis Response Team will be providing emergency funding for students who need to re-apply for DACA before Oct. 5. The ECRT is providing students with a prepaid credit card with $525 that will cover the $495 fee to reapply, money order costs and overnight shipping. Students can apply for funding through the ECRT website and will receive a response within 24 hours. The reapplication for DACA needs to be received by Oct. 5, so students are recommended to send it no later than Oct. 3. No student fees are being used for ECRT, and the fund will not exceed $130,000, according to A.S. President Chimezie Ebiriekwe. Anya Shutovska and Nick Wohlman from the Aztecs Rock Hunger Leadership Team gave a presentation on the upcoming Aztecs Rock Hunger campaign. According to Shutovska and Wohlman, ARH will be a university wide campaign to raise food and money for the San Diego Food Bank and will last from Sept. 30 to Oct. 22. The ARH goal for this year is to raise 500,000 pounds of food. ARH is stressing monetary donations over food donations this year, with $1 equaling 6 pounds of food and $5 equaling 25 meals. Donations are accepted online via a virtual pantry that can be accessed by parents, and donations are tax-deductible. Donations are also accepted via the ARH Venmo account, @AztecsRockHunger2017. There will also be food bins located on campus, but the number of bins has been decreased since last year because ARH is looking for mostly monetary donations. Additionally, ARH will be tabling with Aztec Proud at Viejas Arena and Cal Coast Credit Union Amphitheater, as well as at home sporting events. In an effort to encourage participation in the campaign, ARH will be holding an awards ceremony on Nov. 3 at noon that will give a special recognition to the student organization that contributes the most volunteer hours. ARH wants to “change the culture of philanthropy, not just at SDSU, but in San Diego as a whole,” said Wohlman. ARH encourages students to change their social media profile pictures to the ARH logo during the campaign. For information on volunteering, contact arhvolunteers@gmail.com. Aztec Recreation Director Mark Zakrzewski gave a presentation on the ARC’s accomplishments and goals for the upcoming year. According to Zakrzewski, over the 2016-2017 academic year, the ARC had more than 17,000 members, more than 950,000 turnstile counts and more than 4,000 credit class enrollment in ARC classes. In addition, the Mission Bay Aquatic Center completed its third year of providing instruction and sailing certification for the U.S. Navy with more than 1,000 midshipmen trained and had more than 9,000 equipment rentals. MBAC also received the “Outstanding Community Sailing Program of the Year” award by U.S. Sailing, the national governing body of sailing. Zakrzewski also announced the opening of the new recreation field and its impact on the community at SDSU. During the 2016-2017 academic year, 600 more students participated in intramural sports than the previous year, drop-in recreation hours were available for the first time, outdoor yoga and boot camp classes were offered on the field and sports clubs were able to increase practice time by 10 hours per week. SDSU club sports teams also achieved several accomplishments over the 2016-2017 academic year, according to Zakrzewski. The men’s volleyball club defeated The Ohio State University, winning the 2017 NCVF National Championship. The SDSU rugby club traveled to Tbilisi, Georgia to represent SDSU and the U.S. on a goodwill tour celebrating 25 years of diplomatic relations between the U.S. and Georgia. Goals for the current academic year are to increase membership by 2 percent, expand implementation and assessment of learning outcomes for recreation staff and assess and report student success metrics for participants, Zakrzewski said. Additionally, the ARC aims to update the Aztec Recreation website, remodel the MBAC lobby, and introduce new technologies to enhance operational efficiency. “The ARC mission is to provide high quality programs, services and facilities that inspire active, healthy living and enhance the SDSU experience,” he said. Michael Wiafe, associate justice for the judicial affairs council, said there are still vacant seats on the council and they are looking for new members. Those are asked to go to the A.S. office in person to apply. The SDSU University Police have changed policies for skateboarding in undesignated areas. Instead of receiving a misdemeanor, violators will now receive a $75 administrative fee. Campus safety officers will be handing out flyers informing students of the change, in addition to free 7-11 Slurpee coupons.